It was 1879 when George Sealy, president of the Gulf, Colorado and Santa Fe Railroad, purchased land originally granted to the township of San Felipe de Austin, for the purpose of establishing both railroad lines and a depot. Sealy became a main division point between Galveston and Temple. The railroad became the town's principal employer. With the arrival of the German and Czech settlers farming and ranching became part of the economy. The Missouri Kansas & Texas line from Austin to Houston was built in the 1880's and early 1890's - reaching Houston in 1893. The MK&T Sealy Depot image on the right above is from a postcard postmarked 1908. Approximately 10 years ago when acquiring land for the I-10 expansion, the State of Texas bought the railroad right-of-way from Union Pacific, successor to MK&T, so the former MK&T tracks now end just east of Sealy. The joint passenger depot in the photo above left, was at the southwest corner intersection of the former Santa Fe tracks (BNSF today) and the former MK&T tracks. The view from this image is looking northbound along the Santa Fe tracks. Two of the vehicles in the photo are 1928-1931 Model A Fords. 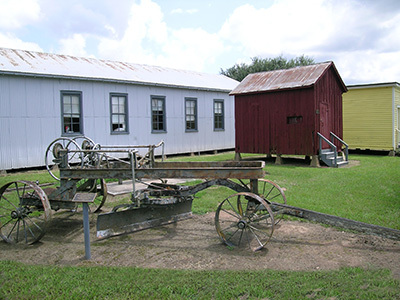 Artifacts from the early days of Sealy and Austin County are displayed, including a caboose and early maintainer. 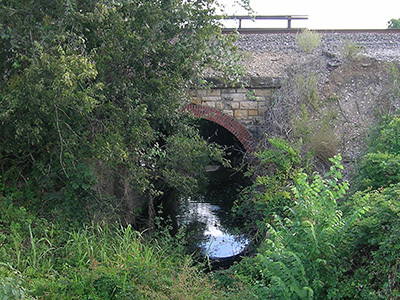 Arched railroad bridges made of stone and brick were constructed in the area for the Gulf Colorado and Santa Fe Railroad in 1880. 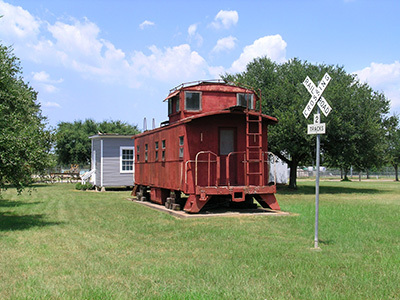 The railroad reached Sealy by December of 1879 and expanded towards Bellville and Brenham in the early 1880's. Area bridges include a two-arch bridge located at Dead man's Creek in Peters and a three-arch bridge located at Bollinger's Creek just outside Sealy, which was a popular spot for picnics in the early 1900's. In 1879, the Gulf, Colorado and Santa Fe Railway Company agent, George Sealy, purchased 11,635 acres at the location of the current Sealy cemetery from the Township of San Felipe de Austin for the purpose of establishing a railroad depot. The village of Sealy soon developed around the depot and on July 5, 1883, the cemetery recorded its first burial here-that of Annie Fowlkes. Families that settled in Sealy purchased cemetery plots directly from the railroad until the company donated the land to cemetery trustees, C. H. Ruff, R. P. Josey and John Hackbarth in 1887. The Sealy cemetery association was founded sometime prior to 1898 and officially chartered in 1924. The ladies of the cemetery society, organized in 1904, helped the association cultivate community support to upgrade and maintain the cemetery. Call us at 979-885-3222 for more detailed information about our area history.